Fashion-conscious Islamic terrorists fighting for ISIS in , have been dealt a blow after their commanders banned them wearing products made by Nike. UK Daily Mail The sports brand features prominently on a leaflet distributed in the terror group’s de facto capital Raqqa warning ISIS jihadis about items of clothing they are no longer allowed to wear. 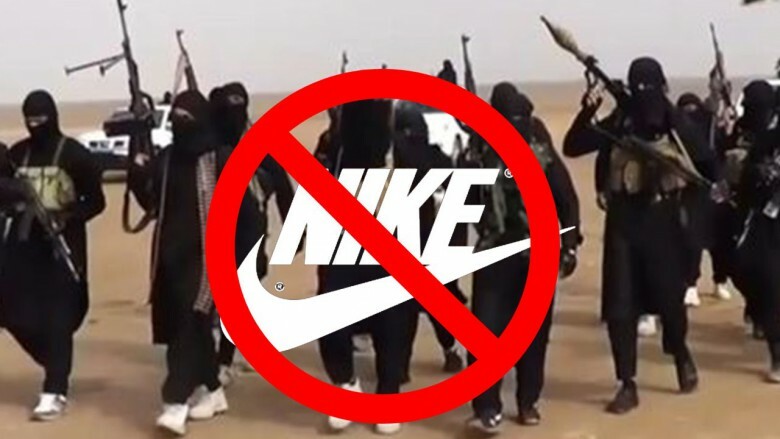 The news comes shortly after one militant decried the popularity of Nike among ISIS fighters, comparing the brand’s name and famous ‘tick’ logo to wearing a Christian cross. His comments prompted a fierce debate with fellow jihadis who argued that it was perfectly acceptable to wear Nike products because they are ‘comfy and good quality, unlike crosses’. 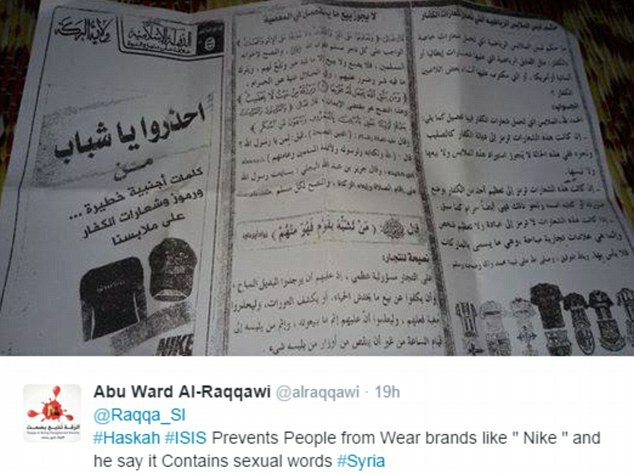 Images of the leaflet banning Nike clothing was shared online by the activist group Raqqa is Being Slaughtered Silently who translated it from Arabic. 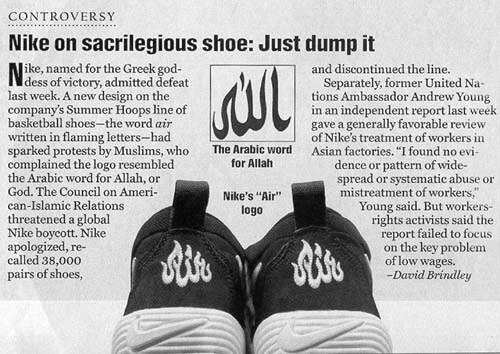 They said Nike was singled out because of its associations with the Greek goddess of the same name and because the word apparently sounds similar to phrases of a sexual nature in Arabic. The leaflet threatens both the buyer and seller of Nike products with punishments ranging from a small fine to whipping or even imprisonment. This is despite the fact one of the group’s most famous commanders, Abu Waheeb, is well known for wearing Western sportswear, including items made by Nike and Adidas. 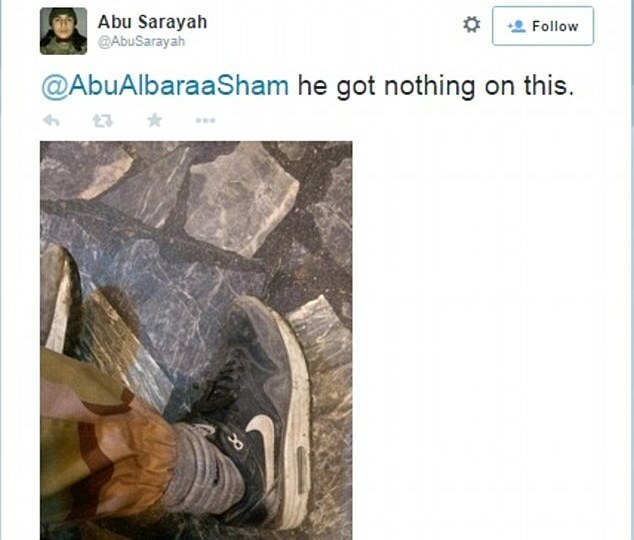 The argument that senior ISIS militants still wear Nike products is unlikely to be considered much of a defence for the millions of brutally oppressed citizens living under the rule of the Islamic State. A recent ban of men wearing jeans – apparently because the clothing ‘provokes sexual desire, and shows the attractions of men’s body’ – has been strictly enforced. In fact some young men seen wearing jeans after the ban was put in place were reportedly told they must exchange their denim products for pyjamas, or face time in prison. As well as products made by Nike, numerous other items of clothing appear on the leaflet. Newly-banned products on the list include anything carrying swear words or sexual phrases. To help non-English speakers recognise the banned terms, the ISIS leaflet helpfully provides a long list of swear words alongside their Arabic translation. Nike did not respond to a request for comment on the ban. Unlike in 2009, when they quickly pulled one of their shoe styles because Muslims found it offensive. Sporting goods giant NIKE is not often brought to amend its product decisions. But a campaign by American Muslim activists acting out of CAIR have gotten Nike to remove a shoe they deemed offensive to Muslims. The shoe in question, which has been sold under the names Air Bakin’, Air Melt, Air Grill and Air B-Que, contains a fire logo (emblem) that resembles the Arabic script for God (Allah). Resembles. but not is. Although CAIR recognizes that the shoe does not actually say Allah, close enough was enough for them to mount a protest.